To get a fresh and airy atmosphere, bring the pond or water garden onto your home yard. If the narrow area becomes an obstacle, make the small size. Pond or water garden doesn’t always need large area. In the limited yard, even on the porch yard, mini garden water can be presented nowadays. Various containers in the form of pottery, stone-shaped bowls, or wide-mouthed barrel on the market, allow you to be creative to enjoy the sound of splashing water or the sparkle of light that bounces off the ripples of water in the mini pond. Container options are also now more diverse, there are ones made ​​of stone, terracotta, stone processing (essentially sand and cement materials) even glass. 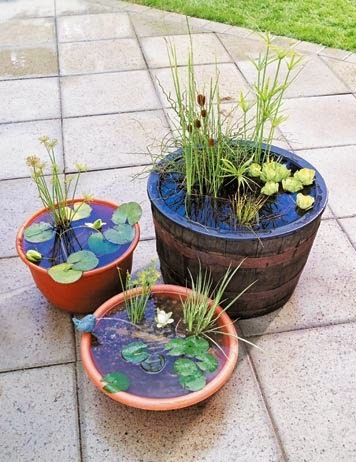 -Select water plants with small leaves or small flowers. Lotus could be an option, as long as it suits the size of the selected pond or water garden. -Select smaller natural stone for accessories in the mini pond. -Set up in such a way to get an impression of nature. -Fill the container with water. Now you have a beautiful mini water garden! Really love these...so simple and yet so enjoyable! I am always into water features of any kind, living in the desert! :-) Thanks for your comments on my blog. Glad you are enjoying our trip to CO!